You'll struggle to find accommodation in the centre of Jasper. There's just 1 accommodation option within 10 kilometres, so make sure to book in advance! Wotif recommends booking a room at the Microtel Inn & Suites by Wyndham Jasper, as it's the only available hotel close to all the action. If you find yourself needing more options in Jasper, try the Seventy-four Ranch and the Hampton Inn AtlantaCanton. They are 13 kilometres and 25 kilometres away from the center. Wotif also suggests the Stratford Motor Inn East Ellijay and the Holiday Inn Express Hotel & Suites Canton. The first is 25 kilometres away from the city, while the other is 25 kilometres away. Don't leave Northwest Georgia without taking the time to appreciate at least a few of the charms of the region. Whether you join locals hiking and shore fishing, tour popular attractions, or simply enjoy the valleys and tablelands, suitable hotel accommodations await with Wotif. If you'd like to experience some nearby cities, consider Canton and Adairsville. Head 25 kilometres to the south of Jasper and you'll find Canton. That said, Adairsville is 45 kilometres to the west. 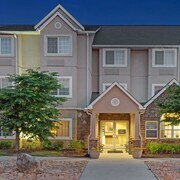 Canton hotels and apartments are the Country Inn and Suites by Carlson Canton and Econo Lodge Inn & Suites. The Hampton Inn & Suites Adairsville-Calhoun Area and Magnuson Hotel Countryside are some of the better ones in Adairsville. Before you head home from Northwest Georgia, make sure you experience some sport. Find Coolray Field to the southeast of Jasper. To sleep close by, make a reservation at the Hampton Inn Atlanta-Mall of Georgia or the SpringHill Suites by Marriott Atlanta Buford. Hartsfield-Jackson Atlanta International Airport is the most convenient airport, and is 90 kilometres from the centre of Jasper. 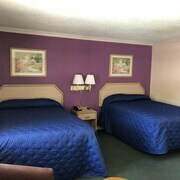 Conveniently located hotels on Wotif are the Residence Inn by Marriott Atlanta Airport North/Virginia Ave and the SpringHill Suites Atlanta Airport Gateway. How Much is a Hotel Room in Jasper? Hotels in Jasper start at AU$63 per night. Prices and availability subject to change. Additional terms may apply.